Do you Have A Reactive Dog? Here’s How You Can Tell, And How You Can Help Your Dog Relax. Barking at squirrels, going nuts when the doorbell rings, getting in squabbles with other dogs – reacting is not unusual dog behavior. After all, dogs will be dogs, right? But what about when these behaviors affect your ability to enjoy normal activities with your pup? I worked with Canine Country Academy (Lawrenceville, GA) Owner, Behavior Consultant and Head Trainer: Paula Nowak, CPDT-KA, CTDI to answer these questions and more. Learn the difference between a “normal” dog and a reactive dog, and what you can do to calm your dog’s fears so you can stop worrying about avoiding your dog’s biggest triggers. Is Your Dog Reacting Normally, Or Are They Reactive? 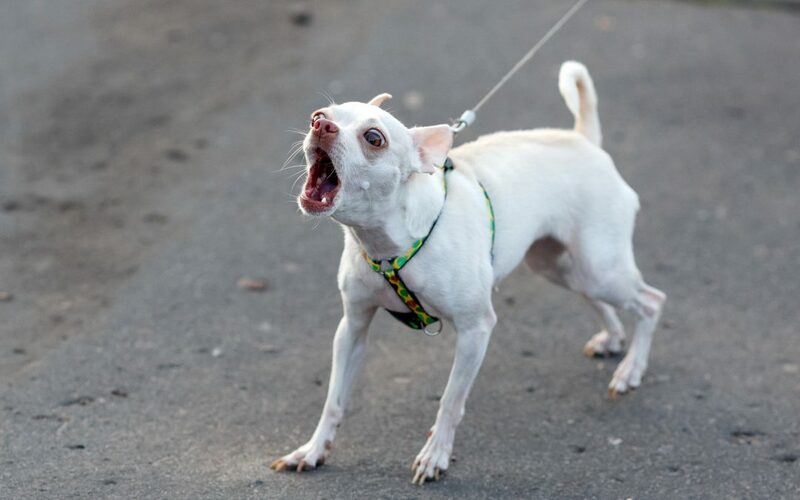 It’s perfectly normal for dogs to react when they see a stranger, prey or another dog. But it’s not normal for your dog to be completely out of control and unable to calm down. Also, take into consideration how you would like your dog to react to exciting triggers. When someone enters my home, Cow goes crazy, and she won’t stop barking until the guest is out of her sight. I’ve taught her to “go lie down” when she’s being reactive, and this works until the guest gets up from their chair or speaks or laughs too loudly for her comfort. The “normal” reaction I want to see from her is a few barks when the guest first arrives, then some investigative sniffs, maybe even accepting some pets if the guest approaches her. She’s a huge cuddle-bug and such a sweetheart, but I think most people who visit would find that very hard to believe. Not all reactive dogs have a history of abuse or trauma that causes them to fly off the handle. Dogs can inherit reactive personality traits. You’ve probably noticed that Retrievers often love strangers, while herding breeds and terriers take a longer time to warm up to new people. Chihuahuas were bred to be watch dogs – they bark to alert their owner of an intruder or visitor. Note the distinction between a watch dog and a guard dog. A guard dog is professionally trained to bite if needed, but most of us don’t want our dogs to attack people. It’s fair for your watch dog to be able to bark to alert you, but they should be able to settle down when asked, and they should not lash out aggressively. There are even more contributing factors to reactivity besides trauma and breeding. A lack of socialization during your dog’s critical fear sensitivity periods can lead to a dog that does not know how to react to certain triggers. “Puppies go through fear sensitivity periods as they mature. During these times they are much more sensitive to bad experiences. For example, if they have a negative experience with a person during developmental milestones and do not get support to overcome the negative experience that can last into adulthood,” says Nowak. Overreacting is sometimes your dog’s desperate attempt to communicate with you when their needs are not being met. Lastly, reactivity could have an underlying medical cause. Each exposure to a trigger is a teaching moment. Your fearful dog needs to know that it’s not necessary for them to be upset or overexcited. It’s so important for you to stay calm and focus on teaching your dog an appropriate reaction, which could be walking away from the trigger instead of barking at it, or calmly alerting you in an appropriate way. The last thing you should do is become reactive yourself. Having a reactive dog can be scary, irritating or embarrassing. These feelings can lead people to look for “quick fixes” that appear to fix the problem at first, but only contribute to a dog’s fear. Punishments teach dogs to suppress their reactions, but they don’t soothe the fear, and sometimes they just turn a scary interaction into a terrifying one. Make sure you have appropriate tools. Use dog-friendly tools to keep your dog under control in public and to help you get their attention back if they are triggered. Use a double clip leash and two point harness to gently encourage your dog to focus on you, rather than the stimulus. “We recommend Ruff Wear Harness or Freedom Harness and a Halti Leash,” says Nowak. Avoid taking your dog’s reactivity personally. It’s not a reflection on who you are as a dog owner. Keep your expectations reasonable. Not every dog can fall in love with everyone they meet. But you don’t have to give up and isolate your dog forever. The first thing you need to do is commit to positive reinforcement training. This is more than just shoveling treats into your dog’s mouth. It’s about building a trust-based relationship so your dog feels safe, and teaching them that it’s okay to make mistakes. Becoming frustrated is normal, especially if this is your first reactive dog. It’s okay to feel a little embarrassed, and to wish you could just go to the park or have guests over without worrying about your dog having a conniption. Remember to work at your dog’s pace. If your dog reacts to cats, don’t put her in a room full of cats and force her to interact. You might start with teaching her to be calm when a cat runs across the street 100 yards away. The exact steps you’ll need to take to create a positive reinforcement training program will need to be customized to your dog’s triggers, severity of reactivity and your available time, resources and tools. It’s never too early or too small of an issue to work closely with a reputable dog trainer on your dog’s reactivity. If you’re not making progress with training, you might want to seek your vet for medication. While it’s not a cure-all, it can be extremely helpful when used in conjunction with a training program. You may also consider seeking a board certified veterinary behaviorist. If you live in or around Lawrenceville, Georgia, check out the Reactive Dog Program at Canine Country Academy. Great tips! When I was a kid I had a dog with a lot of energy and a little anger, my family did not know how to handle it and gave it to another family. Thanks for the tips, now I can understand better about it! From my experience the bonding process is the most important. New dogs that join our walks will bark a lot or try to run off in fear..
Once we have bonded and built up the trust, we are 75% of the way there. Its a fairly simple process, just being nice to them, playing and keeping things calm around them. Slowly we introduce them to pack walks and see how they react to the other dogs. After 10 years they all run to the window when they hear my van pulling up..
I’m no qualified behaviouralist, I only speak from experience and what works for us. Great points in this post, Lindsey, very informative. Sometimes one of my dogs will start barking at a dog while we are out & about for no apparent reason, but I’m lucky to never have had a truly reactive dog – it must be so hard to see that behavior on a daily basis. Spot On! As an animal lover, I always enjoy reading other peoples pet blogs. As someone who works with Homeward Bound fostering all sorts of animals, when we get an unruly dog, we work with them A LOT. It’s so much easier to adopt out a dog that has at least a little training as opposed to one who has not. I mean who wants to adopt a dog who jumps on a 5-year-old and knocks him down? It’s a lot of hard work, but well worth it when they get forever homes. That’s fabulous work, Courtney, I hope to foster like you someday! Now I seem to get why my Chihuahua is reactive only when I’m around. What makes your Chi reactive, Paul, do they have an issue with other people, other animals, or both? Small dogs tend to be more protective to their owner I think. I have 3 dogs and only my Pug gets reactive when someone tries to approach or get near me. A personal protection pug! Though it’s unfortunate that your pug has that problem, that’s a little bit funny to picture. Does your pug calm down once they meet that person? I love the positive approach that you recommend in this article and hope that readers take your suggestions to heart. Looking at things from a dog’s perspective is really helpful in helping dog parents understand what is really going on for their dog. Positive methods based on a true understanding of canine behavior and how to influence it using animal learning science really do work if given the chance – I know because I’m a dog trainer! Great article, thank you! I will definitely share this to our neighbor who has a very reactive dog when seeing a stranger. It will stop from barking unless the stranger have gone away.Thank you for the information Lindsay Pevny. Base on my observation small dogs are tend to be reactive than the big ones. I think you might be right. For us, Matilda is better at meeting new people and I’d consider Cow more reactive, but she spent her early life on the streets. Our dog was super anxious as a puppy and we had to back tie her to help her calm herself down. Thanks for the tips! Back tie… what does that mean? My one year old Schnoodle is very reactive in walks. Especially with other dogs and sometimes with people. I socialized him a lot when he was younger and did everything by the book. When he was approximately 5 month he started barking, lunging and going nuts around other dogs. He has two other dogs he plays with often and there are no issues. He had no issues with the dogs at obedience training. I talked to the trainer about the situation but she is not worried as he is perfect in training. I have difficulty walking him and it’s embarrassing. Ive had dogs before & I considered myself a firm and calm person around him. I’ve tried every collar out there and bring high value treats on my walks to distract him and get him to “look at me” ..nothing works. He goes nuts and gets so overstimulated he will bark at everything. Usually after meeting some dogs he calm down, sometimes he will continue to bark. Not sure if he will outgrow this? I don’t know what else to doe but have him avoid all other dogs on walks(and people sometimes) or walk at night! Seems like he is getting worse & I have exposed this dog to Everything! Matilda was a lot like that at around that age, I think I was letting her socialize with other dogs too much, so she was constantly getting excited to meet other dogs instead of enjoying the walk. Reactivity is tough, it does take work and time, but if you stick to a routine and keep your training consistent, your crazy “teenager” will probably settle down, but it’d be great if you can work with a trainer to see what’s going on and work with your dog’s individual needs.